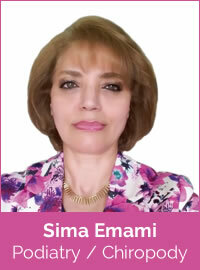 Sima is an experienced podiatrist with a true passion for helping individuals resolve foot and lower limb problems. Whether you are struggling with diabetic foot, childhood pigeon toeing, running injuries, musculoskeletal or neurological conditions, Sima is here to help. Sima offers a full range of podiatry services, using computerised gait analysis to help diagnose unusual movement patterns, and functional orthotics to correct postural problems. She also provides chiropody treatments and advice, assisting Practice Members with conditions including all skin and nail disorders. Sima graduated with a degree in Podiatry from the University of Wales (UWIC) in 2009. Her background prior to this was in physiotherapy, a discipline that complements and augments her services. She is registered with the Health and Care Professions Council (HCPC). Read more about our Podiatry and Chiropody services.